As in all fields of study, art history has its own specialized vocabulary consisting of hundreds of words, but certain basic terms are indispensable for describing artworks and buildings of any time and place. They make up the essential vocabulary of formal analysis, the visual analysis of artistic form. definitions and discussions of the most important art historical terms follow. or by arranging forms in space. To create art forms, artists shape materials (pigment, clay, marble, gold, and many more) with tools (pens, brushes, chisels, and so forth). Each of the materials and tools available has its own potentialities and limitations. Part of all artists’ creative activity is to select the medium and instrument most suitable to the purpose—or to develop new media and tools, such as bronze and concrete in antiquity and cameras and computers in modern times. The processes artists employ, such as applying paint to canvas with a brush, and the distinctive, personal ways they handle materials constitute their technique. Form, material, and technique interrelate and are central to analyzing any work of art. albrecht Dürer, The Four Horsemen of the Apocalypse, ca. 1498. (gift of Junius S. Morgan, 1919). 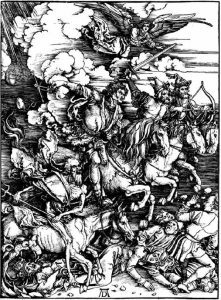 of these line qualities are present in dürer’s Four Horsemen of the Apocalypse (fig.1). Contour lines define the basic shapes of clouds, human and animal limbs, and weapons. Within the forms, series of short broken lines create shadows and textures. An overall pattern of long parallel strokes suggests the dark sky on the frightening day when the world is about to end.